The Globe Sidepress bucket and wringer combos are designed to meet the demanding requirements of the most sanitary environments and feature single bail handles which eliminate the possibility of pinching. They have non-marking ball bearing casters that provide smooth, easy movement, guaranteed not to fall out. The durable stain resistant one-piece construction is easy to clean and sanitize. Our units are quiet and have a smooth operation which is easy to work with and are ideal for all general building, cleaning, restaurants and hotels applications. Globe Angle brooms have superior longevity and are known for their durability. Ideal for cleaning corners, under counters, and hard to reach areas in both wet or dry applications indoor or out. Our Angle brooms are constructed of durable flagged synthetic fibers that are angled to allow effective sweeping of even the hardest to reach places. These flagged bristles effectively trap dirt and dust. Globe industrial corn brooms are both bound with polyester stitching and a heavy duty galvanized wire band to provide added durability and longer life. These brooms are best suited for wet or tough sweeping, both indoor and out. Some usages could include snow removal, warehouses, garages, and any other jobs were rugged sweeping is used. 21 Qt. 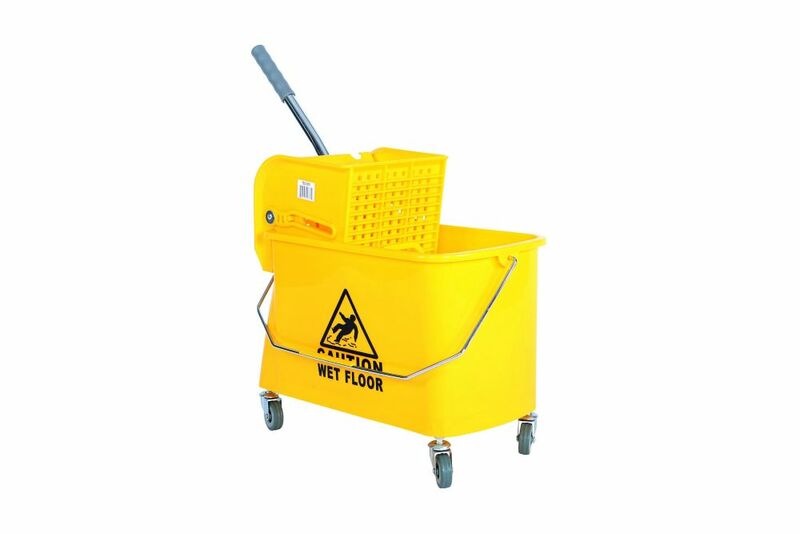 Sidepress Bucket and Wringer Yellow The Globe Sidepress bucket and wringer combos are designed to meet the demanding requirements of the most sanitary environments and feature single bail handles which eliminate the possibility of pinching. They have non-marking ball bearing casters that provide smooth, easy movement, guaranteed not to fall out. The durable stain resistant one-piece construction is easy to clean and sanitize. Our units are quiet and have a smooth operation which is easy to work with and are ideal for all general building, cleaning, restaurants and hotels applications.